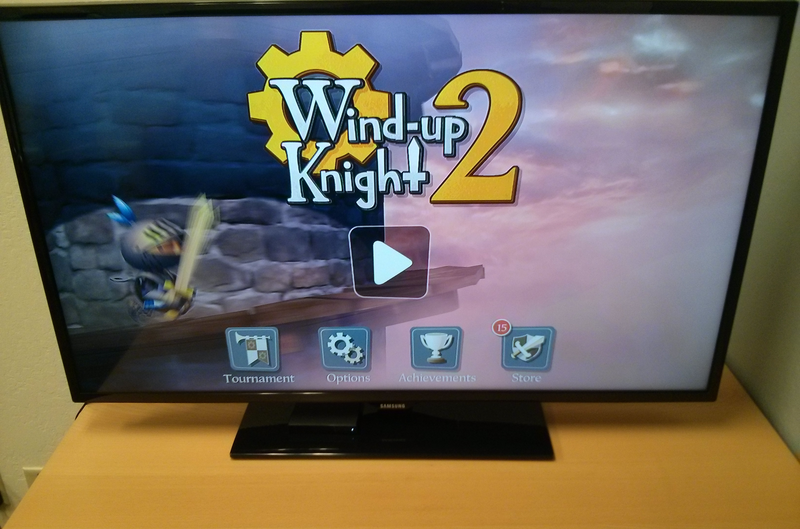 We shipped Wind-up Knight 2 for Android TV last week. If you were at Google IO, maybe you saw our logo flash up there for a moment. If you actually have an Android TV, Wind-up Knight 2 is one of a small set of games that is already setup for it. Playing with a controller is sublime, and it’s absolutely beautiful at 1080p on a giant screen. Wind-up Knight 2 is pretty flippin’ sweet on a TV. Two weeks ago we also shipped for another TV-based device, Amazon’s FireTV. Both of these devices required almost no effort on our part; if your game has controller support built in, shipping an Android game on a TV is trivial. Of course, not every game has built-in support for controllers. Adding controller support to user interface screens can be particularly challenging for games designed around touches and swipes. But in this day and age, I think that every mobile developer should be thinking about how to integrate controllers into their games. Our approach is to do almost all of our development on the Nvidia SHIELD. It’s a fantastic device for developing controller-based games because it’s rugged, highly standards-compliant, and very fast. Once it works on the SHIELD, it’ll work everywhere else. A lot of developers are quick to write these devices off. They find the idea that cheap set-top boxes based on mobile chipsets might “kill consoles” incredible. But I don’t think we should cast Android TV and similar devices as simple competitors to dedicated gaming devices. As I told Gamasutra last year, I think commoditization of game-playing hardware is an eventuality that cannot be avoided, and that’s going to present some tough challenges for traditional consoles. My interest has less to do with who wins and who loses and more to do with expanding the range of markets available to game developers. The more choice developers have about how much money to spend, what kind of game to create, which sort of user to target, how much to charge, and which distribution channel to use, the healthier the industry will be. And a healthy game industry makes more interesting games, takes more creative risks, and reaches more people. Nobody bought an iPhone to play video games at first; it stealthily worked its way into pockets around the world before blossoming into a huge market for games. I think Android TV, and similar devices, can do the same for games running on TVs and played with controllers. In doing so, there is an opportunity to create a whole new channel for games that cannot exist elsewhere; a middle ground between consoles and mobile devices. As I get older, I’m finding it harder to play games. I have seven different consoles connected to my TV at the moment, and yet I haven’t felt the need to go out and buy a PS4 or Xbox One. Not because those devices are poor, just because I appear to have aged out of the target demographic. The games available on those devices all look rad, and there are a couple that have really caught my eye (Access Games’ D4 and Frictional’s SOMA are on the top of my list), but the catalog doesn’t interest me enough to actually go buy a new $399.99 device. At the same time, it’s hard for me to find games on mobile platforms too. This might be a discoverability issue, or it might be that the games I like are not well suited to free-to-play or touch controls. Almost 100% of the games I play these days are on mobile devices, but there are very few that really hook me. I’d buy a Steambox but they aren’t really ready for sale yet, and aren’t likely to be cheap. The promise of devices like Android TV is not to replace consoles, nor to reach the insane scale of mobile games. Rather, they present an opportunity to become a channel for games that can’t be played with a touchscreen but aren’t big, expensive console games either. Experimental games, retro games, narrative-heavy games. Games that can be built and shipped cheaply thanks to standardized chipsets and digital distribution infrastructure, but can still be run on a big screen and played with a controller. Games like Neverending Nightmares, which is shipping for OUYA first and feels perfectly at home on that device. I don’t know if devices like Android TV will actually blossom into an alternative channel for games, but the promise is there. And that’s more than enough reason to support them with Wind-up Knight 2 and future titles. This entry was posted in Android, controllers, game industry, mobile games, wind-up knight. Bookmark the permalink. It reads quite hedged like “You should consider developing for TV-consoles, but it may not work out”. Isn’t that true of any new platform? I’m excited about the potential. It’s available on FireTV already!